A couple of weekends ago we went to an arts & craft fair in our neighborhood. We’ve been each year for the past few years and it is always such fun. One of my favorites was my friend Sondra’s booth because that’s where she showcases all of her fiber art. Her focus is on fabric dolls and this year she added small wall hangings. 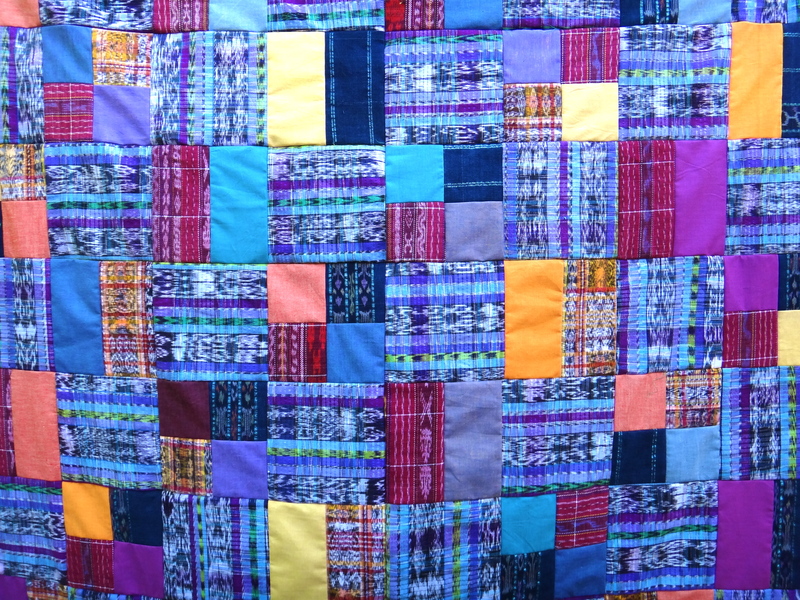 (Sondra is the one who does all the neat quilting on my quilts.) 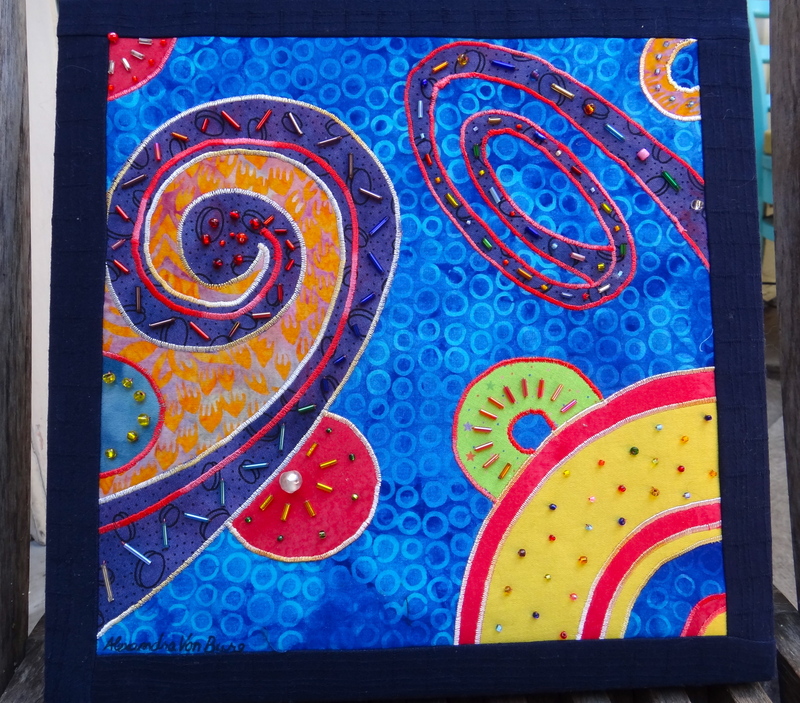 Here is the little wall hanging I bought – love the colors and design. As we were coming to the last group of booths, my eye was immediately caught by some really special fabrics. 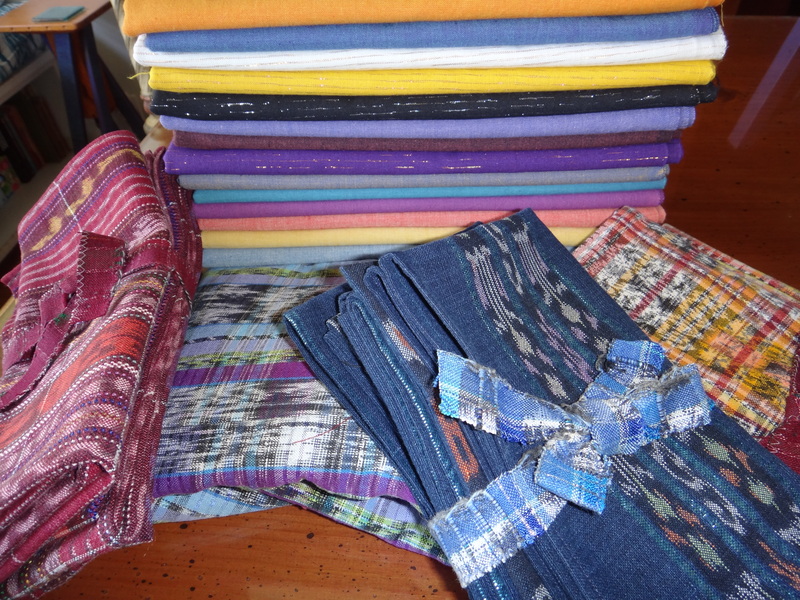 A woman had purchased loads of Guatemalan shirts, mats and vests and had repurposed them into tablecloths, cloth napkins, jackets and purses. The tablecloths and napkins really grabbed my attention. The colors were rich and gorgeous and they felt so soft. I was quite taken. I bought a large tablecloth and 3 sets of napkins. I was already starting to visualize a quilt. As it happened, I also received a small order of solids in the mail that same day. The Guatemalan fabrics and solids looked really nice together and I couldn’t wait to start cutting! I think if I stayed in her booth any longer, I would have bought even more! I kind of wish I had actually!! Here is a close up so you can see the fabrics. I love them! Here is the main part of the quilt so far. Beautiful – and how cool when something comes together like that. I like the use of solids to help showcase the wonderful fabrics! Really interesting fabrics. The solids have worked well with them. Thanks Karen! The colors are different than I usually work with and that made it even more fun to play with. I was pleasantly surprised that the fabrics did not fray when I cut them. 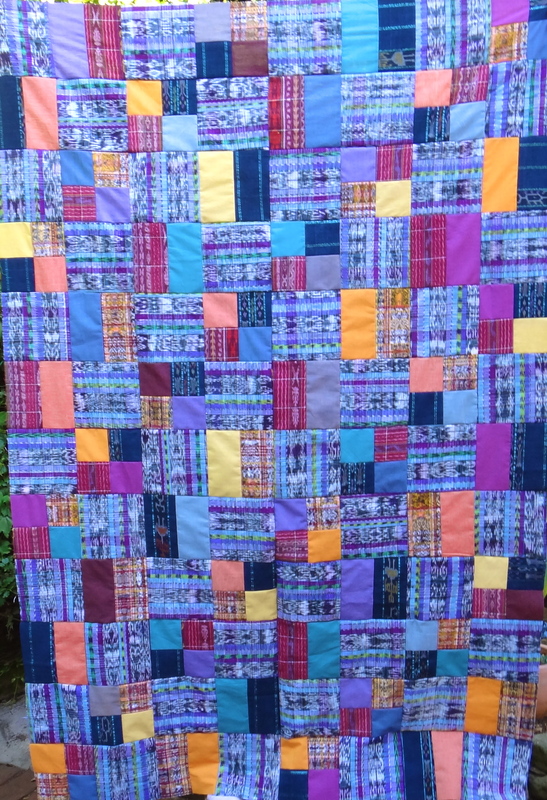 ← 2014 New Quilt Blogger Blog Hop – Welcome!